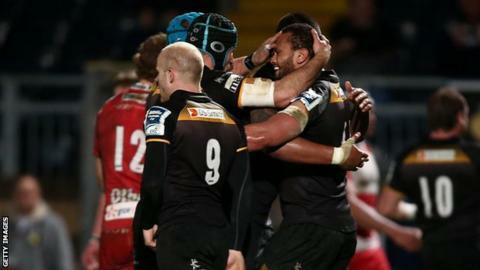 London Wasps director of rugby Dai Young said the performance in the win over Gloucester in the Amlin Challenge Cup quarter-final had been coming. Tries from Matt Mullan, Carlo Festuccia and Will Helu, plus 21 points from the boot of fly-half Andy Goode, saw Wasps book a home semi-final with Bath. "Anyone who has watched us over the past weeks knew the right performance has been brewing," said Young. "We took the chances that we had and that was really pleasing." In the previous two seasons, London Wasps have lost to the eventual winners of the Amlin Challenge Cup at the quarter-final stage, falling to Leinster in 2012-13 and Biarritz in 2011-12. Young added: "It's a good step up from where we've been over the last month and we seem to save our best for this competition." With Young's side having little chance of making it into the top six of the Premiership, a strong line-up was named and they took control in the early stages. They stayed in control for the majority of the game until number eight Nathan Hughes was sin-binned, which allowed Gloucester to score two converted tries. "We showed real intent but that yellow card really hurt us," Young admitted. "However, I am really impressed at how we came back and pulled ourselves together. "We didn't panic, took our chances and thoroughly deserved to win."